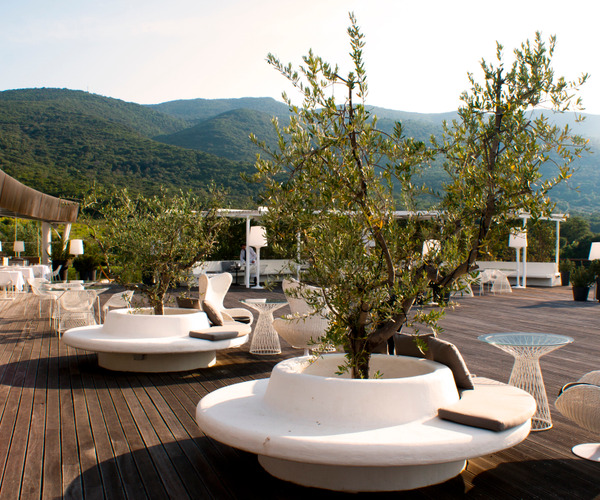 Neighboring the Italian town of Porto Ercole in Tuscany’s Maremma region, the Argentario Golf Resort & Spa is a strikingly modern architectural fixture positioned against the backdrop of cork-oak woods and ancient olive tree groves. The five-star destination spa devotes itself to a delicate balance of nature and wellness, with a range of outdoor physical endeavors and a contemporary-designed spa and medical spa dedicated to mind and spirit. Spa amenities include indoor/outdoor pools, a fitness center, Kneipp circuit and bio sauna with chromatherapy. An 18-hole eco-friendly golf course is the site of many Italian and Tuscan tournaments, and a gourmet restaurant serves Italian, Maremman and Tuscan fare. Argentario is within a five-minute car ride of the Duna Feniglia Nature Reserve, as well as Porto Santo Stefano, where guests can hop aboard ferry boats to the islands of Giglio and Giannutri. At Espace Wellness Center, modern interiors juxtapose with luxury treatments like Carita and St. Barth facials and massages, along with beauty services such as waxing, manicures, pedicures and hair care. Black hues reflect a dramatic effect against light wood accents and airy, white areas, and an outdoor/indoor swimming pool complex — complete with jetted tubs, thalassotherapy amenities, Kneipp pools and hot tubs — overlooks the resort’s golf course and adjacent Argentario Polo Club. The Mediterranean spa exudes a peaceful feel balanced by its immersion in Monte Argentario’s vegetation, within five minutes of the Duna Feniglia nature reserve. There are six treatment rooms in the 2,700-square-meter spa, where guests can relax with services like the signature St. Barth Softness; the 50-minute ritual softens skin with a body wrap and massage. At the MediSPA, dermo-aesthetic treatments such as Hyperbaric Oxygen Therapy and nutrition and naturopathy programming are available. Argentario Resort Golf & Spa is within a short distance from several landmarks like Porto Santo Stefano, Giglio and Giannutri Islands, Lake Burano and Tarot Garden, but the five-star destination spa provides its own array of entertainment. On its 203 acres, guests will discover a Technogym-equipped wellness center with personal trainers on hand and indoor/outdoor swimming pools to try, plus jogging trails, three tennis courts and a football field. Golfers can hit the links on the 18-hole, par-71 Argentario Golf Club set amid Mediterranean nature of a protected nature preserve, capped off by a lagoon, the sea and rolling hills. Meeting accommodations are housed in the business center and include three conference rooms hosting up to 324; a board room for private meetings of up to 12; and a large outdoor deck with panoramic views that holds the capacity of 200. Wedding venues encompass the poolside garden area, the Club Room and Dama Dama restaurant. 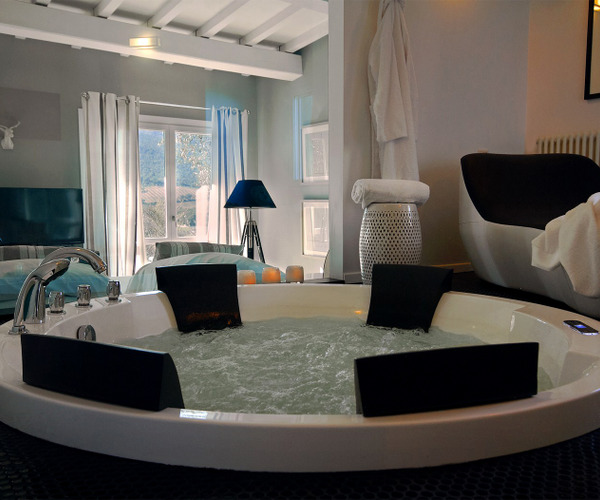 A variety of guest accommodations, individually designed by Andrea Fogli, is available at Argentario Resort Golf & Spa. Superior rooms, located on the ground floor, feature a minimalist vibe with vintage furnishings and modern photographs, while junior suites and suites, occupying the first to fourth floors, offer distinct categories, including Spa Lofts, or open-plan rooms with a hydro-massage tub, Turkish bath and Kinesis workout equipment. The three-bedroom cottage, located hillside 200 meters from the resort, is offered for a more secluded stay and comes outfitted with a large living room, kitchen and patio. The modern Dama Dama Restaurant serves gourmet Mediterranean cuisine. Interiors are inspired by a stylish mountain retreat, with natural fabrics, plush velvet accents and hunting trophies reflecting a warm, authentic experience. During the cooler season, guests can enjoy meals beside the fireplace or by candlelight; come warmer months, a panoramic terrace with verdant green vistas invites guests to dine alfresco.